In the last month I have not been idle. Despite a very unplesant cold snap in February I have been able to keep on top of my sowing schedule and hope that you all will now be limbering up to get a load of veggies going if you haven’t started already. I started a second sowing of onion seed in mid-February. It is certainly fine to sow more now. I like Franchi Seeds who sell large packets of seed for a fraction of the price of their competitors. I like to grow red onions which are as a easy to grow as white ones, but, for reasons I cannot understand, cost twice as much in the shops! Try Rossa Lunga di Firenze. I also planted a Dutch variety of shallot called Ouddorpse Bruin given to me by a fellow vegaholic. Due to problems last year with white rot on the allotment I am growing alliums now on a new plot I have been given nearby which hasn’t had alliums on it for many years. I also planted out a brilliant garlic, Solent Whight. Highly recommended. Just yesterday I saw shallots, onion sets and garlic for sale in a garden centre, so there is still time to get these in the ground. 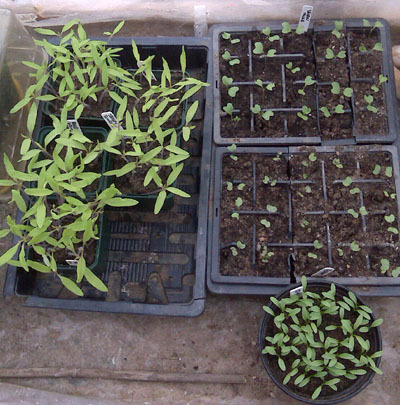 By the end of February my tomato seedlings were reay to be transplanted into 3-inch pots. 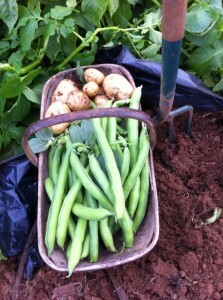 I also transplanted the Syrian mini broad-beans I sowed a month ago into the allotment under a cloche. 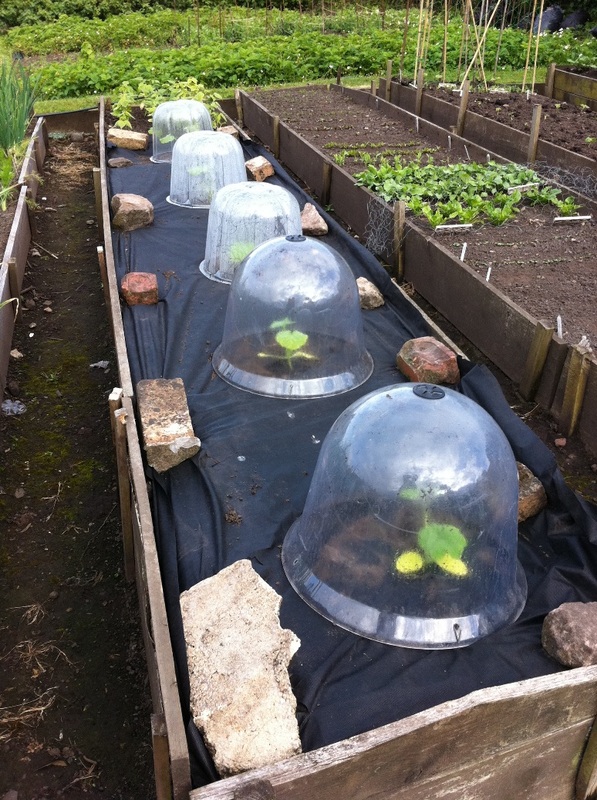 I also transplanted under bell-cloches some rather pathetic cauliflower plants, All The Year Round, which I had been overwintering in the greenhouse. The seed of the same variety I sowed at the end of January are growing well and are now hardening off in a cold-frame. I will be interested to see how the two crops perform. I also sowed a quantity of my favourite broad bean, Bowlands Beauty, into my new plot in a rasied bed which had a foot of wonderful compost added. 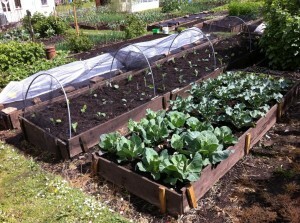 In the last couple of days I have sown more lettuce, Little Gem and an HSL variety, Brown Bath Cos. If you want to have a continual supply of lettuce througout the year successional sowing is essential. 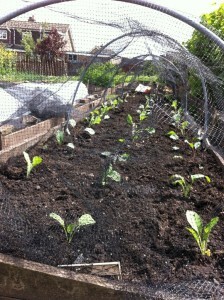 I have lettuce seedlings in a polytunnel which I will transplant in a coule of weeks’ time. My over-wintered lettuce in the polytunnels are almost ready now that the endive and radicchio on the allotment are all but finished. I will sow more lettuce later in March – just a pinch of seed at a time. Now too is a good time to start off a few leeks in pots in the greenhouse or on a sunny windowsill. And today was a bit of a marathon as I sowed parsnip, spring onions and radish on the allotment under cloches and in the greeenhouse, fennel, celeriac and artichoke in modules in the propagator. I also sowed some patio tomatoes, Tumbler To and Maskotka, which will be planted up finally into hanging baskets in late April. 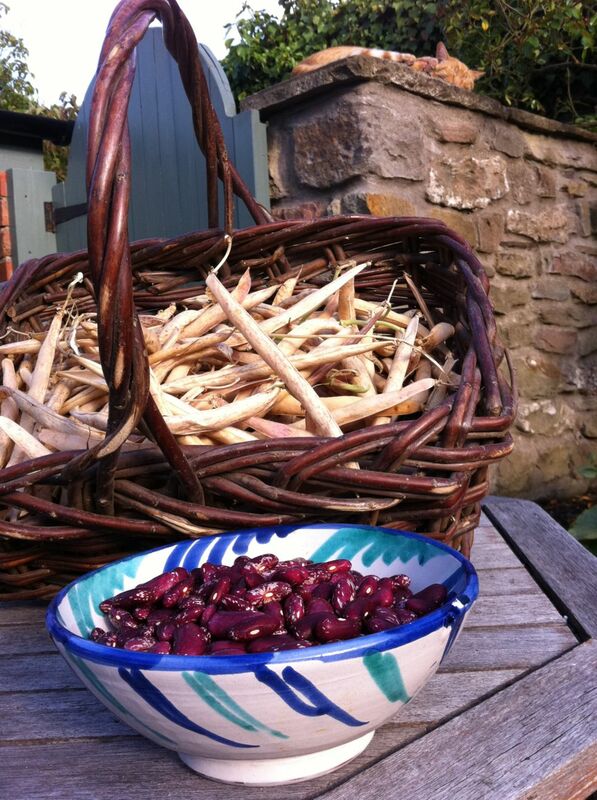 And finally I sowed a nice purple-flowered climbing French bean called Cobra which gives a good crop of green beans and a yellow wax bean called Gialli. These will be planted out in a polytunnel for an early crop at the end of March or in early April along with sweetcorn. With sowing over it was time to pot up some chillies and spend a considerable amount of time reconfiguring everything to fit in the greenhouse! 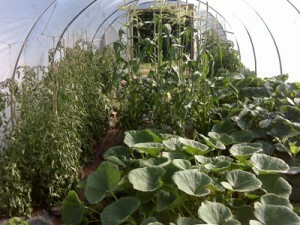 I am a passionate believer in the virtues of polytunnels. If you have the space they provide a far cheaper alternative to a greenhouse and will extend the growing season dramatically. I am fortunate to have three of them; two which are 30 feet long by fourteen feet wide and one which is ten feet wide by 15 feet long. This gives me the best part of 1000 square feet to grow in. Succession is very important to get the most out of one’s polytunnels. In late Februaruy I will plant new potatoes. In March I will be planting up French beans and sweet corn. 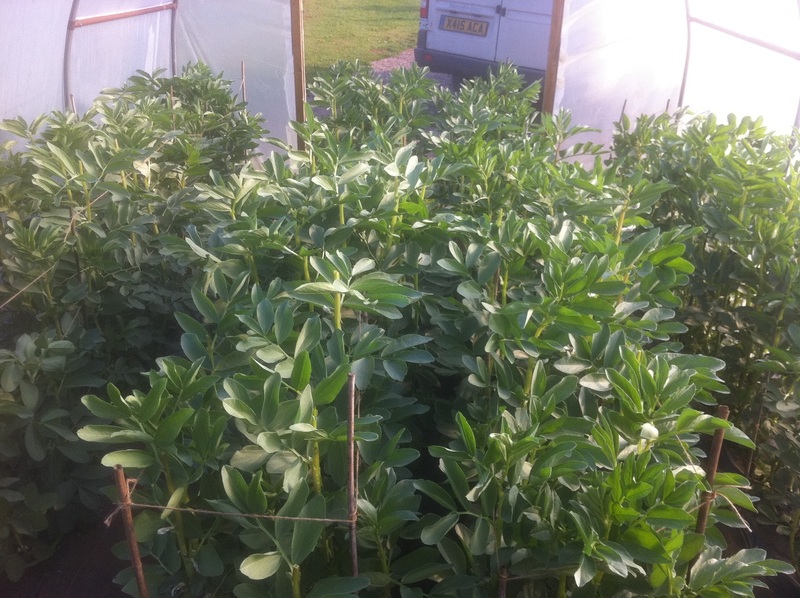 I use these poltytunnels to grow crops in isolation for seed so this year i will also be sowing Stenner runner bean as I have very little stock of this magnificent variety and in another polytunnel I will grow climbing beans. Come June things can get a bit crowded as you can see! Last week I was busy sowing seeds and making videos at the same time. 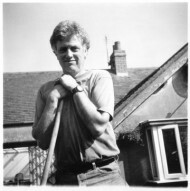 Today I have uploaded six – there is another to follow soon. You can find them on the video page and also on the relevant pages on the’How to Grow Vegetables’ menu. I really hope you find these films about sowing seeds of tomatoes, peppers and chillies, onions, broad beans, cabbages, cauliflowers and broccoli useful. I have also included a very compact tour of my propagator and a peep inside my seed bank. As we enter the last week of January I get very itchy fingers and the urge to sow becomes all consuming. So today I set the thermostat in the propagator in my greenhouse to 24 degrees, mixed a load of seed compost (3 parts John Innes soilless seed compost with one part low peat multi-purpose), selected my seeds, prepared some trays, loo-rolls and root-trainers and got to work. This year I will be growing fewer new varieties of tomato and capsicum, concentrating on some old favourites and grwoing for fresh supplies of seed. So, I sowed into four inch pots a sprinkling each of these tomatoes; Nello’s Plum, an heirloom Italian tomato from Tuscany; Washington Cottage, an escapee from a US research centre which yields an abundance of small super-sweet fruit; Sungold, a popular yellow and very sweet cherry tomato; Small Red Pear, a gift from an HSL seed guardian which produces bunches of long trusses of tiny fruit and a local variety of Syrian indertimante that I am intrigued to see how it will turn out. I sowed eight varieties of capsicum – Ukraine, one of my favourie discoveries which I have been growing for the last 25 years, having discovered this hot, sweet, three-lobed pepper in a market in Donetsk. This year I am growing from seed saved in 2003 inorder to refresh the supply; a long Syrian chilli from a local seed supplier – Future Seeds – simply called Flefleh; another sweet pepper with a rugged shape simply called Flefleh Helweh; a hot sweet small pepper from Syria given to me by a local farmer; a small sweet pepper from Tobago, originally collected by my dentist’s husband; Pasilla Bajo, a south American hot sweet paprika type which is a deep chocolate colour and one of my favourite sweet chilli peppers I found many years ago in the Moroccan desert I simply call Morocco. I also sowed some Up to Date onion seed that I had saved in 2010 and a very exciting broad bean I found in a market in Damascus. 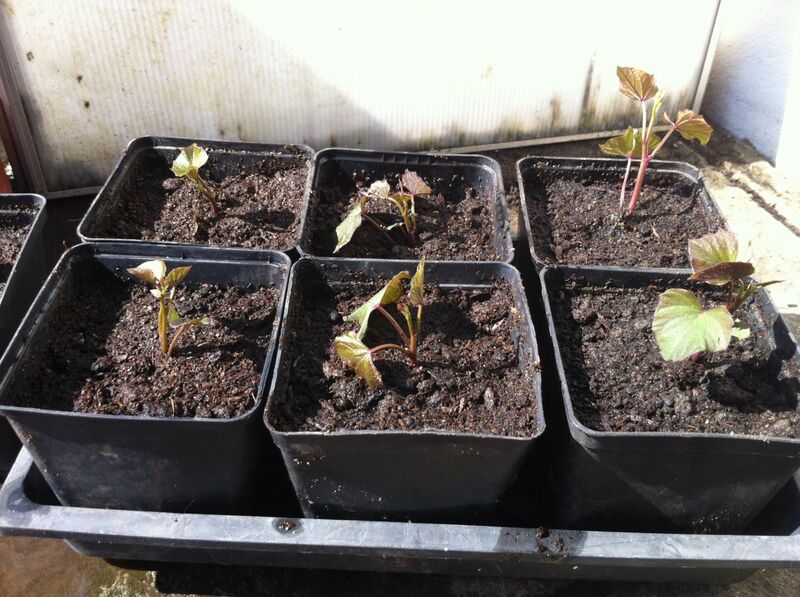 These I sowed individuallu into loo-roll centres and put onto teh greenhouse floor. I call it mini because it is grown specifically to be eaten as an immature bean pod. I ate this bean many times when I was in Syria in March 2011 and found them utterly delicious. Finally I sowed in root trainers two varieties of early summer cabbage, Greyhound and an F1 variety Sherwood, which I am trying for the first time from D.T. Brown. I also sowed the cauliflower All The Year round and the magnificent perpetually flowering hybrid broccoli Olympia. It was a busy day today because I also recorded a number of videos which I hope to have on the site in the next few days. Today I couldn’t wait any longer. I had to start sowing. Too early for outside but with one of my polytunnels now empty after completing harvesting new potatoes I had prepared a lovely series of seed beds a week ago, giving a light dressing of fish, blood and bone. In the warmth of a the polytunnel – it being another glorious, sunny day today – I sowed two varieties of carrot; an F1 early from Dobies called Parano and Amsterdam Forcing 3 Sprint from D.T. Brown. 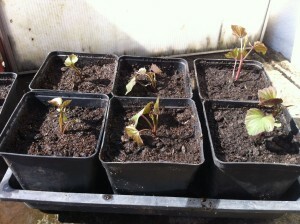 I also sowed two varieities of beetroot; Red Ace and Boltardy, both from the Organic Gardening Catalogue. Lettuce varieites were Winter Density from Mr Fothergill and Winter Lattughino, bio-dynamic seed I was given by the head gardener at my oldRudolph Steiner school, Michael Hall. I also broadcast a handfull of winter mixed salad leaf from Dobies and sowed too a short row of rocket from Franchi seeds and Scarlet Globe Radish from Garden organic. To be sure of lots of tsaty leaves in March and April I also sowed a short row of a spinach variety called Campania from Marshalls. It’s been a very strange winter so far. On 7th October last year I sowed the pea variety Douce Provence in one of my polytunnels. Normally I would expect this variety to grow through the winter to no more than six inches. However, I have a crop now at least a foot hight, if not taller and coming into flower. In fact the first flowers appeared before Christmas. 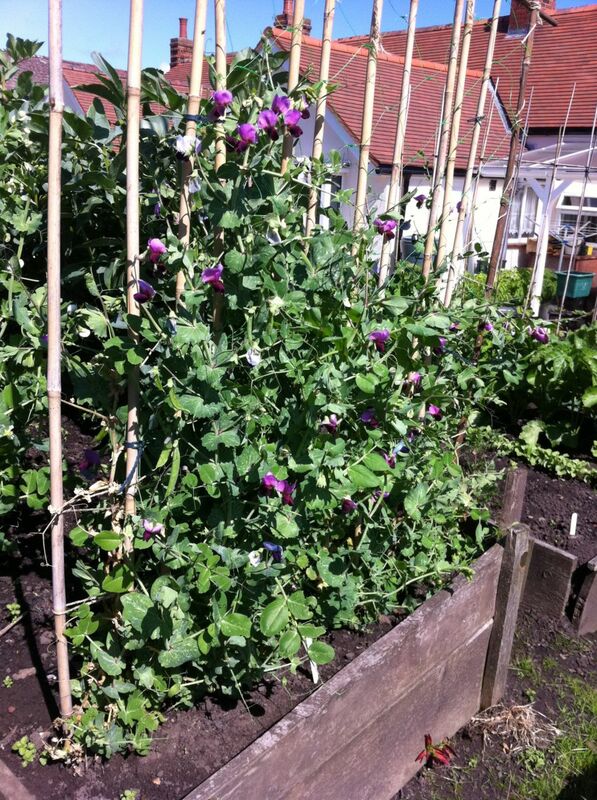 I will be fascinated to see if the crop will set properly if temperatures remain low – already the first flowers have set – and maybe I’ll be eating peas before Easter. Although I do keep a minimum temperature in my greenhouse I have not expected to still have chillies ripening. However, Pubescens Rocoto, a black-seeded variety is still gowing strong. Very hot and pungent, I expect to keep harvesting through to the end of February! The last couple of months have been busy tending, harvesting and sowing for winter. It is now that one realises the long row of runner beans sown with enthusiasm in May is yielding enough to feed the 5,000. Remember the glut now and which will continue until the frosts kill the plants. A little of lots of different vegetables is more satisfying than a lot of just a few varieties. At this time of year I start to collect and clean seed for myself, for other seed collectors and for the Heritage Seed library. Please check out the website seed saving section to see what I do and how you too can save your own seed to grow next year. It may be the middle of August but it is not too late to be sowing now for crops later this autumn and into the winter. If you haven’t sown spring cabbage or Kale get started now. 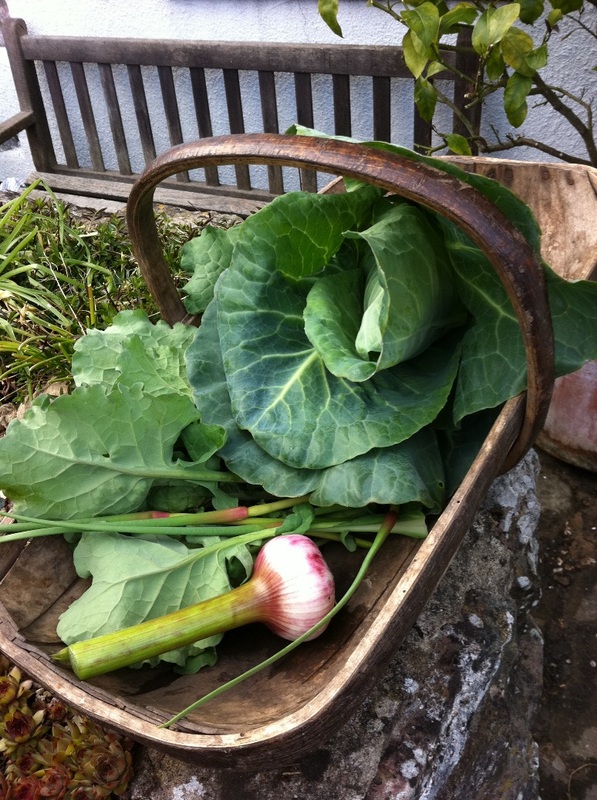 I like spring cabbage like Advantage, but the best stuff for those mid-winter meals and good spring greens is kale. My absolute favourite is Asparagus Kale and I have a good supply of fresh seed just harvested. 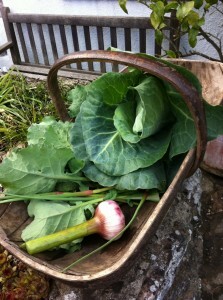 So long as you are able to transplant your brassicas by then end of September you will get a good crop come springtime. 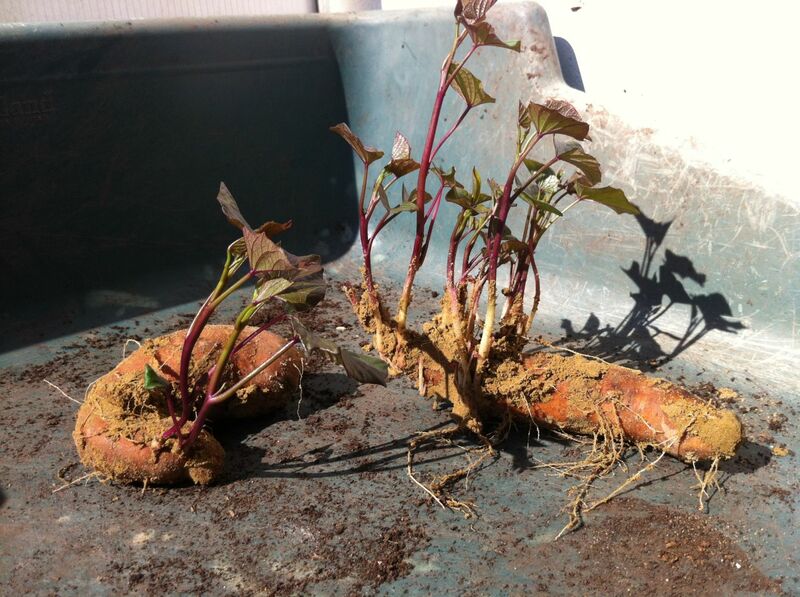 Start off seed in pots or root trainers in regular John Innes seed compost. 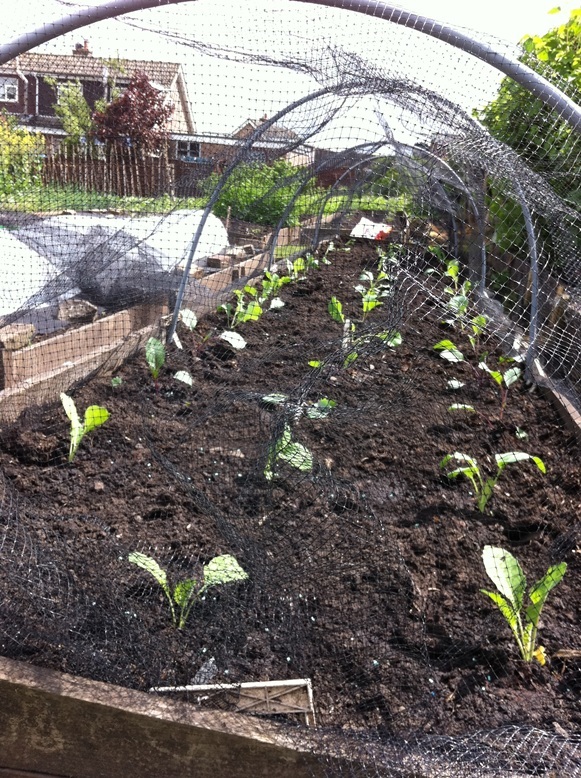 Keep well watered and also protect seedlings from attack by cabbage white butterflies using a screen of enviromesh or fleece which is obtainable from any half-decent garden center. Overwintering lettuce can also be sown now. Winter Density is a very reliable cos-type which if sown outside now can be thinned or transplanted in September either under a sturdy cloche or into the greenhouse border. Large pots in a greenhouse are also good for growing on your lettuce. Allow four plants to a 12-inch pot of good multi-purpose compost. 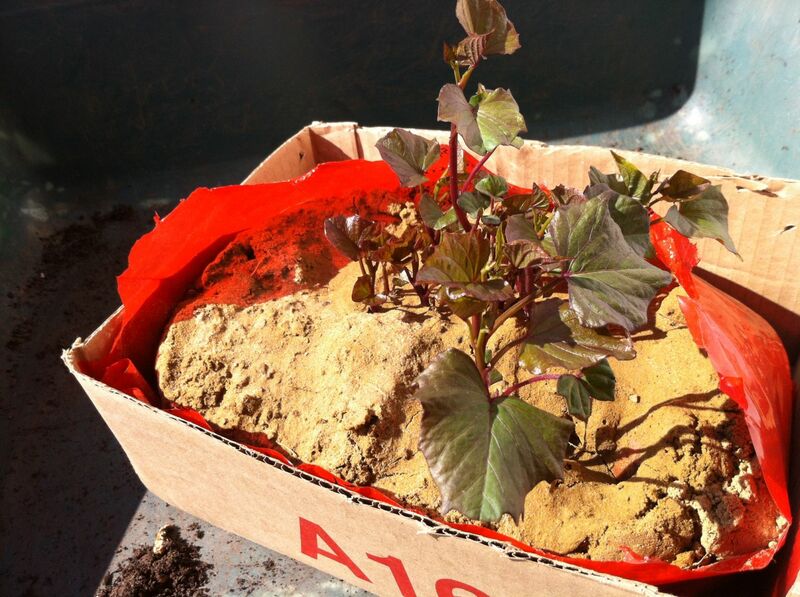 I like to add some dried blood when transplanting to encourage leafy growth. This is especially important early in the new year if you want crisp tasty lettuce for Valentine’s day and before! 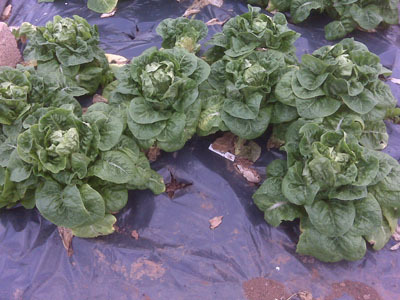 Other very reliable winter lettuce worth a go are Valdor and the best cos of the lot, Lobjoits Green Cos. Rocket, Mizuna and many Chinese greens can be sown now for harvesting up until Christmas and beyond if the weather is clement. The spring may have been hot and dry, but June has changed all that. Cool and wet. 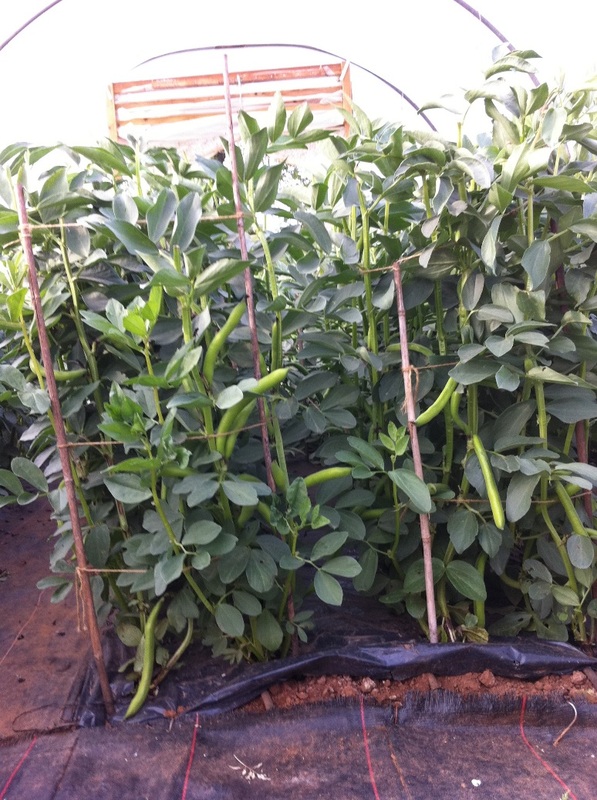 The chilly nights haven’t slowed down the rate of growth however and the much-needed rain has come just at the right time for peas and beans which need polnety of water if they are to provide good crops. After a very slow start and considerable problems from sparrows eating the growing tips, my peas are finally getting into their stride. 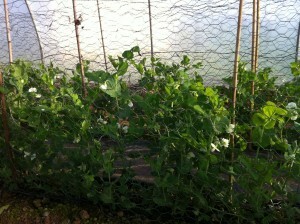 Early crops sown in March are in full flower and I did eat the first peas yesterday – straight from the pod. My trial of Kew Blue are finally climbing but I fear they may not reach their full potential even though the plants of eight seeds I sowed are flowering quite freely. It’s the middle of May and the last couple of weeks have been very busy, catching up with planting, transplanting and sowing. The brassicas I sowed in late March needed to be transplanted into their riased beds. I noticed that the dreaded Small Cabbage wWhite is around and found a few clusters of their yellow eggs on the underside of some of the leaves, so I decided to cover immediately with a fine mesh to protect the crop. The cabbage and broccoli I transplanted back in March are growing on well and should be ready for eating in the next few weeks. As well as transplanting cabbages last week I have also transplanted one of the tastiest squash I know, Pompeon, into one of my polytunnels. 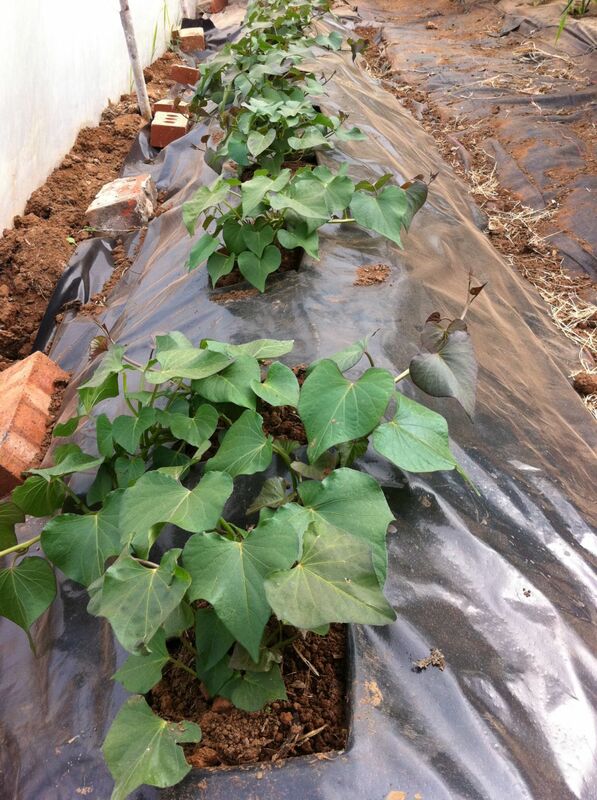 I am growing aa American heirloom Armenian cucumber too. I planted four rather straggly plants, two-feet apart in the greenhouse on the allotment and plan to train them up canes and along wires. I also planted a couple of melon called Sugar Baby with which I have had some success in the past. 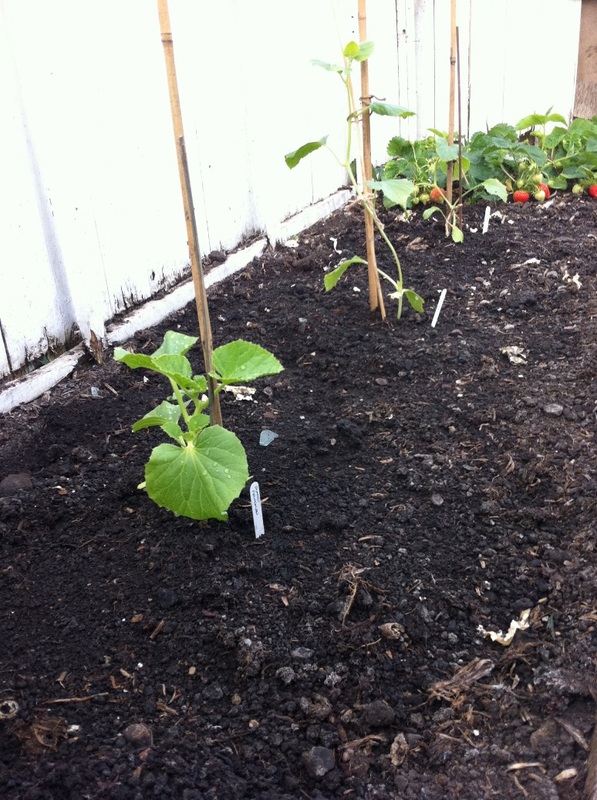 I like to give my courgettes plenty of room so plant them at about three-foot intervals. I’ll keep the bell cloches on them for a couple of weeks until they are growing on strongly. Courgettes, like all cucurbits are greedy feeders in need of lots of water. I will eat some of the crop but plan to select a number of courgettes to grow to full maturity so that I can save and share the seed. I amexcited about this local Syrian variety as the ones I ate in Syria in April where firm and tasty, a marked improvement on most courgettes I have eaten before. I recently returned from nearly three weeks travelling in Jordan and Syria. Although my principal reason for the trip was to visit ruins and walk in the mountains and desert, I didn’t need any excuses not to go in search of vegetable seeds. Syria was especially interesting. The country grows a huge amount of food and at this time of year the fields in the fertile valleys and in the terraced hills and mountains are full of crops of cucumbers, courgettes, tomatoes, egg plant, cabbages, salad crops and young wheat, flowering apple trees, cherry blossom everywhere and pistachio, fig, almond and apricot trees all coming into growth. Olives are grown at every elevation from mountain terrace to desert plain. The cucumbers and courgettes are especially interesting as Syrians eat their cucumbers now when they are no more than about 12 cms long. They breed a particular variety to eat very young. Their courgettes are interesting too. 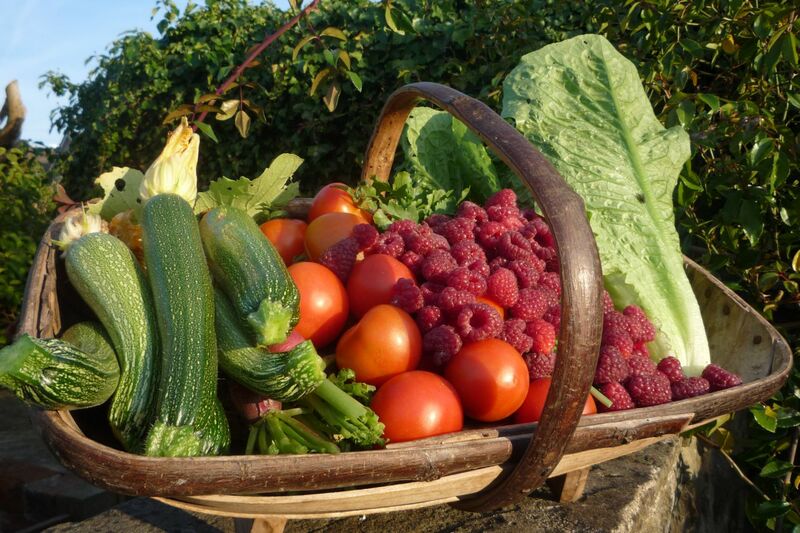 Although they do grow American hybrid varieties including one called Babylon, some farmers also grow a native type which has a lower water content than the courgettes we are used to eating. These little Syrian beauties are firm, flavoursome and I found a refreshing alternative to the rather dull vegetable we usually grow. I visited a food market in Aleppo and found two stalls selling vegetable seed, all locally grown. As soon as I got home on 19th April I sowed two varieties of courgette, one produced by a company called ocal Seed(!) and another which came loose from a horticultural supplier. 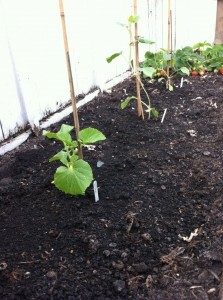 I also sowed a local variety of mini-cucumber. Today, Easter Sunday 24th April and everything has germinated. Very exciting. In both Jordan and Syria they like to eat young broad beans, chopped up and blanched before mixing with olive oil. This dish is a great delicacy and I was keen to find some local seed. In Damascus in the old souk I found a horticultural supplier who had sacks of seed. 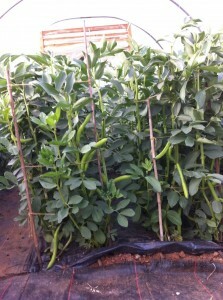 The bean is very small and the pods quite short and variable. I plan to sow some tomorrow. Fava beans are also popular and I ate them in a rich, creamy sauce flavoured with cumin. I was able to buy about 100 grams of this seed too. So it will be interesting to see how they grow although I am tempted to wait until next year to sow some as I want a long growing season to ensure I get a good crop of dried Fava, (broad) bean. In both Damascus and Aleppo I found some interesting sweet peppers and some mild, large chillies. In this part of the world the locals do not eat very spicy food. Again, the seed I found in the market will have to wait until 2012 until I try to grow them. Now, back home, I have been catching up with my veggie plans. 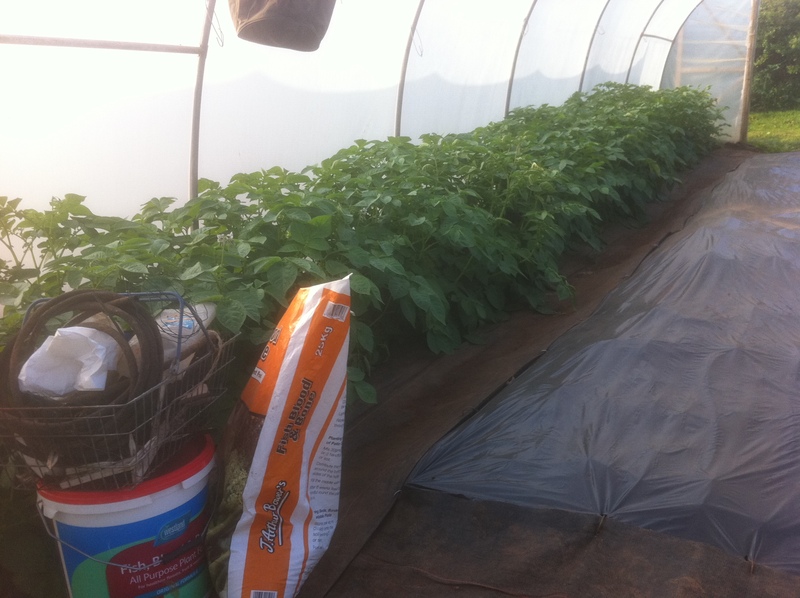 Capsicums and the last of the tomato plants have been planted into the poly tunnels. A major weed on the allotment, sowing of roots and salad crops, transplanting under cloches of beans, sowing more peas, runner beans and French beans continues. Hopefully, with a dry Easter Monday I will be fully up to date. Early potatoes soon ready for digging. Aquadulce broad beans with good flower set. 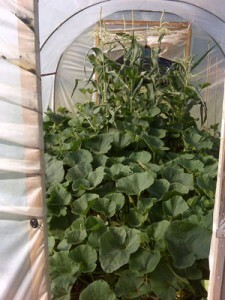 It is a joy to have polytunnels. My early crop of the potato Rocket is in flower and I scrabbled around a few plants to see how the tubers are doing. There is certainly a meal now so this week i will be eating my first potatoes of 2011. 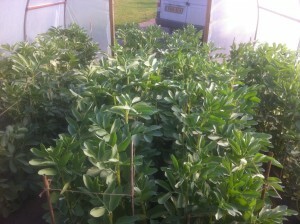 The broad beans I sowed in another polytunnel are doing very well. Although, not the mos prolific flowers, Aquadulce gives a good crop and I have had a very good flower set. Today there are many pods, just a couple of inches long, starting to fill. I’ll be eating whole juvenile beans on May Day!